I'm just putting it out here. I'm a 47 year old Mom. I have wrinkles and I have gray hair hidden under a bottle of root touch up. I do not feel my age but I can see it when I look in the mirror. I love the sun and I have skin damage. When I take selfies I tend to hold the camera up above my head looking up to camouflage the laugh lines and crows feet. I have age spots and freckles. The struggle is real. So when a friend of mine asked if I would like to try a product called Arbonne. I figured, why not? I usually shy away from independent consultants selling products. I do not like being pushed to "join" or "host" parties, but I was willing to give this one a try by sampling some of the skin products and more. It really scared me when she asked if I would take some before and after photos. "What? no make up? Show my wrinkles? Oh crap! I guess I will. Some make up will be applied but I will not use any filters or editing as I want to see the real results, so bare with me as I brave the task. Arbonne has everything you need to stay healthy, from skin care to nutrition. Its made of pure safe botanical ingredients that are scientifically tested and with no animal or by-products. Whether you want to feel great, get fit or have great skin, Arbonne has the solution. They also offer acne solutions, makeup,and hair products. They even offer products for men and babies. At the end of my post, I will have the links to find these products and much more from Arbonne Consultant Heather. Within a couple days, I received a package in the mail full of some really cool samples to try from Arbonne. 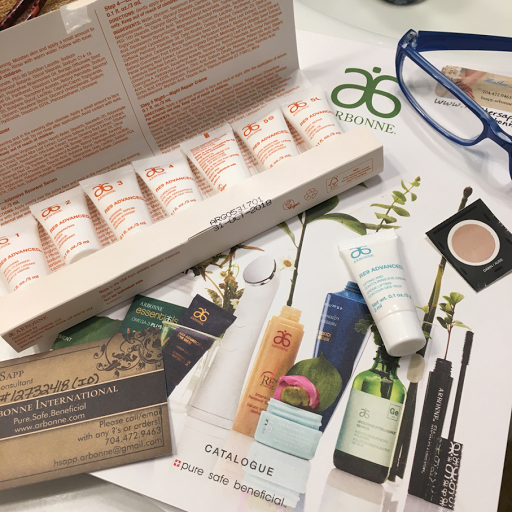 Including skin care products, fit chews, fizzy energy drink sticks, eye shadow and face wash along with interesting information on Arbonne Products. The first thing I tried was the Genius nightly Resurfacing Pad which made my facial skin look and feel healthier after just one application. I followed this with the "Lifting and Contouring Eye Cream". It's made to lift skin around the eye area to give a more awaking appearance as it firms and tightens. 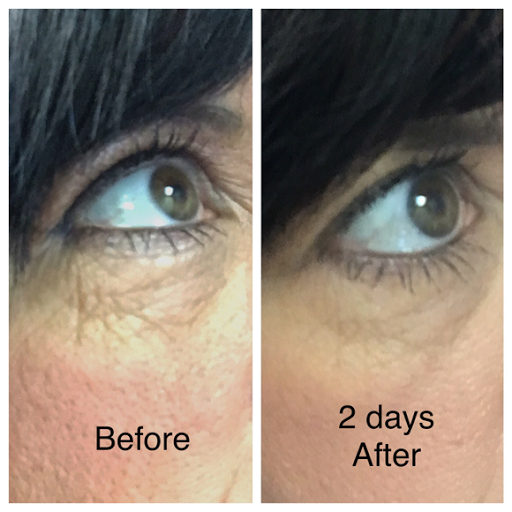 Results of the lifting and contouring eye cream. After applying the eye cream, I felt some tingling on my skin. This only lasted a couple seconds then I could actually feel the skin tightening. 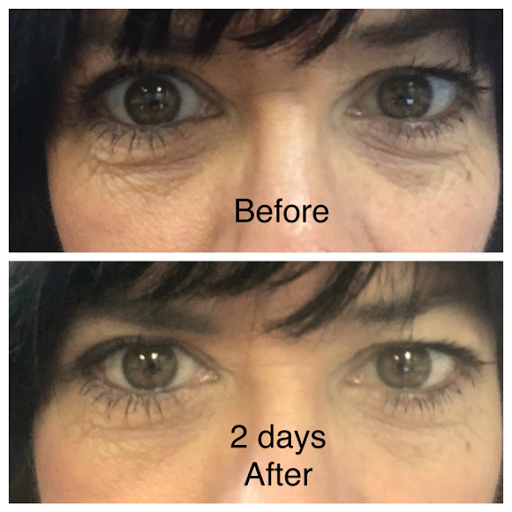 No redness and no irritation. I think it did pretty good within two days. I can see a little difference. I think it plumped a few of those creases around my eyes. The little bags under my eyes seem to diminished dramatically. I can imagine how well it would work after the recommended 8 weeks. I give this one a thumbs up. Next I tried the "RE9 Advanced Set". 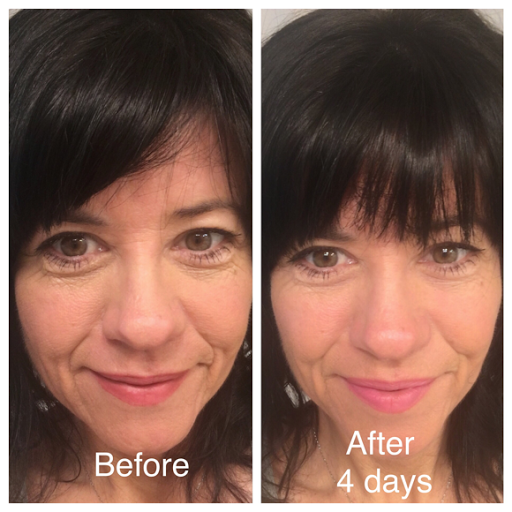 This is a five step daily process that includes cleanser, regenerating toner, renewal serum, corrective eye cream, and day/night repair and restore cream with broad spectrum SPF 20. First I have to say I loved the refreshing smell. It had a citrus orange aroma as I applied it each day and that awakened me enough alone! It also had a tingling sensation that only lasted a couple seconds. My face felt clean and fresh all day even under make up. I liked the toner and renewal serum best as it made my face feel fresh and smooth. Since it was only a sample, I could not get the full effects. But after a few applications, I could see a slight difference in my appearance. It made my face feel refreshed. I really noticed the toning of my skin and almost felt like not wearing any makeup. The blotchy redness I usually have on my face was lighter and less noticeable and my skin felt tighter. I give this a thumbs up. 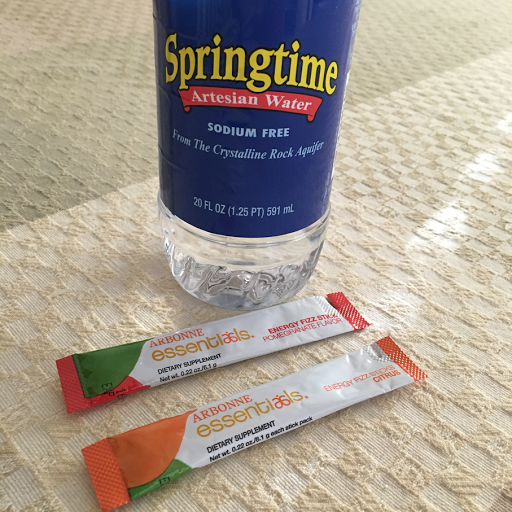 My package of samples also included a couple of the "Energy Fizz Sticks" . These you add to your water for a refreshing bubbly flavor and burst of energy without the caffeine or dangerous ingredients in the canned energy drinks. These are a great kick start before workouts. They have antioxidants and include a blend of Ginseng and Guarana combined with vitamin B to temporarily help promote alertness and enhance performance. It was OK. At first sip, It tasted to me like drinking an Alka-seltzer, blahh! But after I chilled it a bit and drank more, it wasn't so bad. It was like a flavored soda water. My favorite flavor was the Pomegranate but the citrus was OK too. I've heard others say they love these. It gave me a little energy. By 3:00 in the afternoon, I usually start feeling sluggish and tired. This fizzy drink enhancer kept me energized enough to feel good until dinner time. It actually helped with some hunger cravings too. However, to be honest. I'm not a big fan of energy drinks. Arbornne has a whole catalogue of products that are healthy and good for you. I was a little spectacle after reading some other reviews but I think these products will hold up to their name. I had no side effects and was pleased with the effects I saw. You should give them a try. You can contact Heather through these links. She will be happy to help answer any of your questions and lead you to the products you need to look younger and feel healthier. Note: I am not affiliated or being paid by Arbonne. These are my own volunteered, honest opinions and the results are real. I see a BIG difference in your before & after photos!! thanks so much for taking time out to voluntarily leave this review! WOW!! I knew these products were awesome but your pics are AMAZING!! My favorite fizz stick flavor is also pomegranate, hehe.. I'm not sure specifically what makes you feel " tingling" but to me it just means it's working! Thanks again for leaving your honest thoughts and sharing your before and after pics! This is Marvin Klose telling you this is a great post on Arbonne. Oh shoot, you can see my real name, can't you. Wow! I see the difference in the two day photos. Looks like a good product. Women are only as old as their will and motivation to use hair dye. You look great for 47 by the way. That's remarkable. There are some amazing products out there. My wife Jilda stays up on skin care. I'd be willing to bet she's heard of the stuff you used. I am amazed at the pretty women who want to be even more! LOL My girl fits right in. I tell her she doesn't need a thing, BUT she is a real woman. BTW You look great for any age. I betcha Nick thinks so!!! !